Update 1 - 13 2019 are there, thx to Jiri. I tried the whole package from the mega.nz link, a few topics above, and it works fine on my machine. I don't manage to install the updates, could someone please explain me the detailed procedure ? 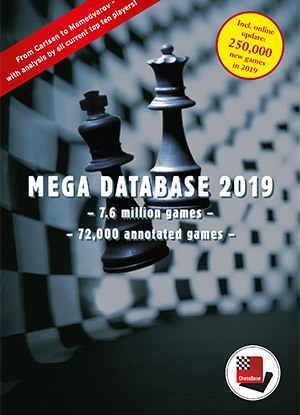 I've only got games from 2018-2019 in my Mega Database 2019! Hey guys, I need help! I've only got games from 2018-2019. I haven't got games from 1500-2018. If anyone has them, can you please help me how to get them? I've installed the database from jiri's mega. I would really really appreciate help and be happy if I could get it! Thanks in advance and have a successful and enjoyable life! How to use this update? Maybe some miss this playerbase - so far always delivered together with the Mega. But not with the Mega 2019. With the 'feature' mentioned above, you can (must) download this playerbase. But to do so, you need an account, maybe (don't know, the product description is pretty cryptic) even a Mega subscription. How to use this bro? Can anybody post the updates 14-16? Thanks! CroCo_DiLe-, in Chessbase main window you have several icons, i.e., the Megabase, Clipbase and maybe some other. Double-click the chosen update, after that the Chessbase will automatically open, and the update will appear on its desktop. Sometimes, when you double-click a cbv file and not the cbh one, even two icons with the same name may appear in CB. That's because cbv is an archive, and one icon is blank, you may delete it from CB desktop by pressing Del, whereas the other icon stands for the real cbh game base. Then just drag the update icon over the Megabase icon. CB will ask if you want to append 5005 or so games to the Megabase. Press Yes. After that, in a minute, your Megabase will be updated. Do the same with all the updates one by one. Alternatively, drag the updates 2, 3, 4, 5, etc. over update 1 and then drag and drop the update 1 over Megabase. Kir wrote: CroCo_DiLe-, in Chessbase main window you have several icons, i.e., the Megabase, Clipbase and maybe some other. no update on mega.nz, anywhere else? steppenwolf2504 wrote: Can anybody post the updates 14-16? Thanks! Some immortal guy can post the new updates? I managed to install the CB15, thank you for your efforts! However I can't load a new UCI engine like stockfish. Only error code comes up. rebelshaka wrote: Some immortal guy can post the new updates? If you can not find solution, go to chessok.com and download from their free service the updates january part 4 and onwards. that will give you same results, minus the analysis you used to have with chessbase. Thank you very much, thats very helpful, didnt know chessok had this. You said to start with part 3 because first 2 are like the same till update 13? 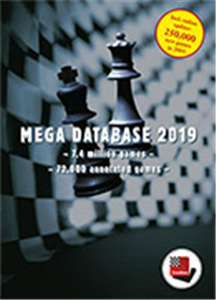 I checked my mega2019 and i have games till 10 january aprox. I will download all 2019+ anyway for now, but thanks again. rebelshaka wrote: Thank you very much, thats very helpful, didnt know chessok had this. You said to start with part 3 because first 2 are like the same till update 13? Can someone share new updates? jeando wrote: please new updates.